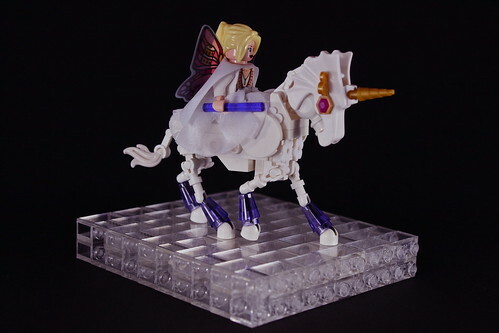 Katie is a wonderful member of the online Lego universe, and faerie princess of the cheese slope. Constantly weaving fantasy stained glass masterpieces and endless memorizing patterns the rest of us are consistently inspired to invest in detail. She is also awesome and encouraging, and a good friend to many. But many of you here at Classic-Castle know this already. Gorgeous! Very nice use of parts. No matter how many gorgeous castles pass my eye, I just wish one day I could come up with a jewel like this. Ingenious! Who would think of a horse with a hen's brain? Wow! Very Nice! I'm not that big on unicorns. ... But it's very creative! The jeweled eye is excellent! eilonwy77 is very lucky to have such friends. Very nice tribute. The sigfig is amazing. Amaizing creation. And photo is briliant too. You already know my views on this, but I'll say once again, "This is quite a homage to Katie to be sure. Brilliant work!" Thanks everyone for your kind and very encouraging comments! Some questions that have popped up in other posts I figured I'd answer here just in case there are others wondering the same thing. -The eyes are genie turban jewels and they are connected by a squashed rubber hose that was threaded through the helmet. -The legs are again not my invention as shown in the description link, and they are in fact very sturdy! Im more afraid of the skeletal arms breaking than the connection being weak. -And if you havent looked at Eilonwy77 photostream its a must especially if your ever going to work on tapestry, tiling, or stained glass windows! That's one incredible unicorn! At first I thought it was custom, but then I recognized all the official Lego parts. Well done! Great build, there's some awesome parts usage there, I really love the legs and head especially. Best unicorn ever. I thought I was doing a little bit better at keeping up with the Classic-Castle posts lately, but I missed this. But now I found it, and I just want to say again how lucky I am, and thrilled, and how pleased. Your work is so beautiful, both this unicorn and all the rest of it. Thank you so very much! Very nice! I love all the NPU.